Registration for our July 27 offering has closed. Due to overwhelming citizen response, there are no remaining seats for that class. The Department has scheduled our fourth offering of this free 1.5 hour seminar, designed to help keep citizens safe during the unthinkable. 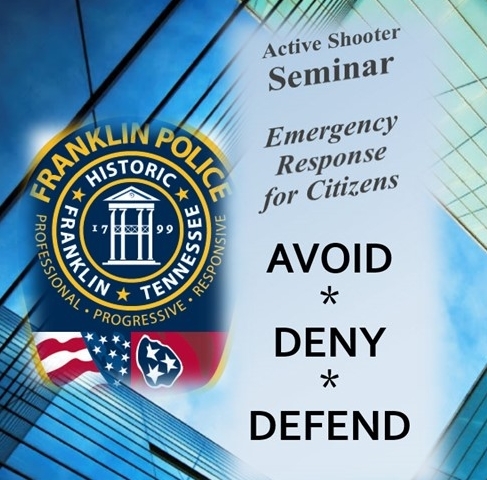 On August 4, Franklin Police Officers will share with citizens, employers, and community leaders, way to improve their response to an unforeseen, mass violence encounter. During the one and a half hour seminar, officers will discuss three main, national best practices: Avoid, Deny, Defend.